How do you fit more staff into your existing office? Below is how our design team improve office space efficiency to comfortably fit 15% to 20% more staff into an existing space, while minimising the cost. Long banks of bench desks, like a battery chicken farm, channel noise for maximum distraction. Tiny desks are impractical and devalue staff. Hotdesking everyone has proven ineffective – staff based in the office need a home. Figure out what the organisation needs, including what storage is really required (especially in paperless offices), how many staff are office-based and agile-working, how many new staff are soon to join, and what types of spaces are sought. Correctly size desks. L-shaped desks were used in the 1990s to fit large cathode ray tube computer monitors and lots of paperwork. Today’s flat screen monitors and low-paper working mean that desks can be reduced comfortably to 1.2m to 1.4m wide by 0.7m deep. Create virtual walls. In open plan offices, a simple solution to create privacy is to spread everyone out. This wastes space. Instead create virtual walls using carpet tiles. This proves remarkably effective at influencing movement and creating privacy. Optimally space desks. Too little room between desks means staff need to move to let their colleagues pass and/or are brushed as they move by. Too much room and thoroughfares are created (harming privacy) and space is wasted. Include breakout spaces. 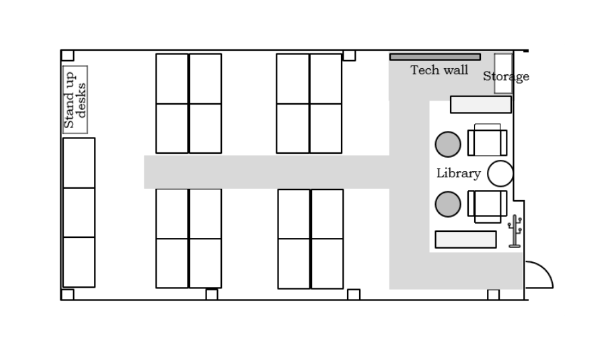 While this may seem counter-intuitive when trying to save space, well-designed breakout areas allow staff to work flexibly (freeing up hotdesk space), act as an overflow when everyone is in the office, create informal meeting spaces easing the pressure on meeting rooms, contain, absorb and block noise, provide a wow factor for the office, and improve collaboration. Resize existing desks. A good furniture remanufacturer can reduce existing desks for a fraction of the cost of buying replacements and disposing of the old ones. This can include fitting new tops in a fresh modern finish. Avoid disposal costs. Remanufacturing your existing furniture or finding a good home for it (like donating it to a remanufacturing company) avoids disposal costs which normally run at £10 per item for landfilling (due to the UK government’s landfill tax) and £10 for transport and handling. That is £20 per item of furniture that can be avoided. Secure a buy-back agreement. Some remanufacturers, like Rype Office, offer to buy back the furniture that they sell to you for further remanufacturing when you no longer require it. This shows their commitment to quality products and secures an income from your furniture at the end of its useful life. Lease. Your office leases office space, photocopiers and cars and now you can also lease furniture at attractive interest rates. This spreads the cost as well as enabling you to hand back the furniture (for further remanufacturing) at the end of the lease. Your office furniture remanufacturer should be able to arrange a lease for you. Use reclaimed carpet tiles to create attractive walkways. Grade A reclaimed carpet tiles, which come from the corners of rooms and under furniture where wear and tear is minimal, are a high quality, cost-effective alternative to new. Replacing only walkways creates virtual walls for privacy, adds colour and wow factor to an office, attracts the eye away from the remaining tiles, frees up the replaced tiles to swap out damaged tiles elsewhere, and is substantially lower cost than replacing the whole floor. This walkway, created at CECA from Grade A reclaimed carpet tiles, creates privacy for those sitting adjacent and adds colour to the office. For more on the costs of office furniture and how to reduce them see Office Furniture Costs. And you can read about remanufactured office furniture. Dr Greg Lavery is the Managing Director of Rype Office, which helps clients to create beautiful, productive and space-efficient offices at substantial cost savings through good design and by using remanufactured and sustainable office furniture. Email Greg@RypeOffice.com or phone 033 3358 3330.